I did a training recently for literally our best clients in the world, talking about how you coach people through excuses. If you’ve got a brother or a sister, or a teammate, or somebody in your life who’s always making excuses, or you’re the person who’s always making excuses about why you can’t have your dream, why people don’t support you, why you can’t break through or achieve more or make more, this episode is going to blow your mind. I’m so stoked to talk with you today about some big topics that you’ve been asking me about in coaching. I know lots of you are Certified High Performance Coaches and you’re in this place where you’re thinking, “Right now I work with people who sometimes offer a lot of excuses, and I don’t know how to get over them because the same excuse comes up.” Or, “I don’t know when it’s appropriate to challenge people, so how do you challenge people respectfully, but still get the effect that you’re after?” Some of these big topics are what we’re going to be taking on today. 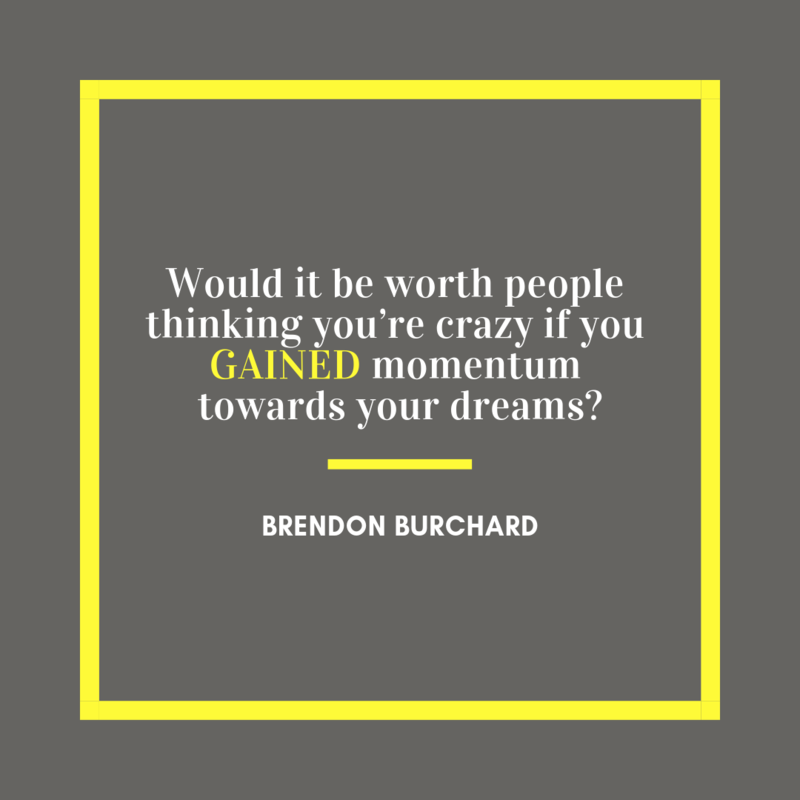 I’ll be sharing with you some things that really seem to work well when I am doing an actual coaching session to make sure that I get people really enrolled in the idea that they can do more. I want to get people really enrolled in the idea that they can make their dreams happen, as well as enrolled in the idea that whatever topic we’re taking on in whatever session of coaching that I’m focused on, that they really feel, truly and deeply, that they can move the needle or they can make a difference. And I know that’s why we’re all here. Let’s jump into a simple framework I’m going to show you and then we’re going to break it down for you. For most excuses people make, I’m always being conscious about where they’re making them. The 3 main types of excuses are personal, social, and operational. Here are the big three reasons that a lot of people don’t do things. They’re making excuses about things because they’re scared socially. They make excuses because they’re terrified of embarrassment. They might call it something else, but they’re scared of embarrassment. You’re not scared to start your dream, you’re embarrassed to be seen starting small. If they quit their job and they go to start something new, they don’t want all their former people to see them doing something that looks new and fresh, and maybe ugly or not put together. They’re scared to be embarrassed and have other people judge them. They might use different language, like “Well, I’m just fearful.” But if you really dig down into fear, most people are just scared to be embarrassed. They’re scared to try something and fail at it, and the perception of that failure really shuts them down. So we have to ask different questions. I’ll say something like, “Are you not going to try this because you’re scared of what somebody else might think?” I ask that all the time, and almost all the time, people reply with, “I’m not scared, but you know, I’m worried what my spouse will think.” Or “I’m not scared, but people at work might think I’m a little crazy.” I’ll explore that with them, because if we can’t get them over that line of embarrassment and the willingness for trial and error, we won’t get them to do anything. 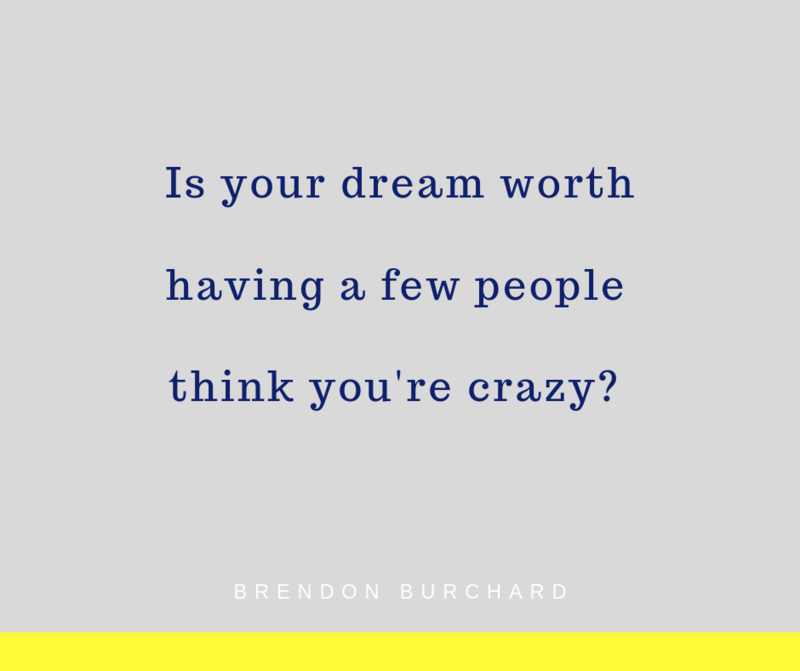 And they tend to reply, “Well, no, I’ve never tried this before.” I’ll reply, “You’re making an assumption that you’d feel uncomfortable.” But, I also want to give them permission to ask, “Is this dream worth having a few people think you’re crazy?” I’ll open up that dialogue. #2: Is it worth it? A big frame here, in helping people get over excuses, is getting them tied back how important the goal or project is to them. “Great. The question isn’t about survival. It sounds to me like the real question is whether you want it. We know you’ll survive. I’m curious, if we know you’ll survive, what will it feel like if you’re thriving? “Wouldn’t it be worthwhile to have a few doubters, or to look stupid, or be seen as silly if you woke up energized by what you were doing? Would that be worth it?” I’ll just start painting that picture for them. 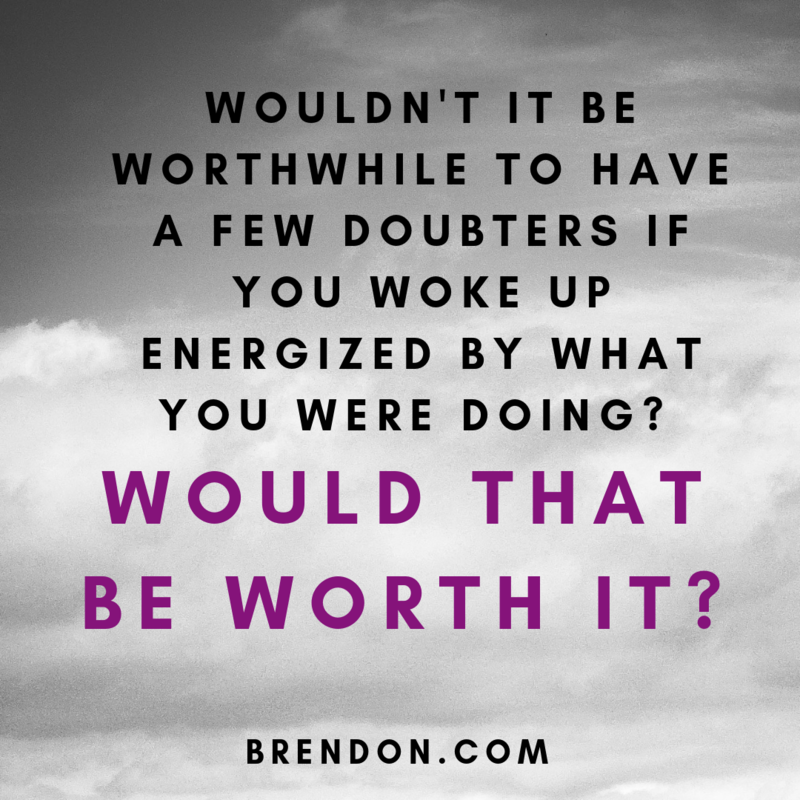 “Would it be worth it if you woke up knowing you were doing what you were meant to do? 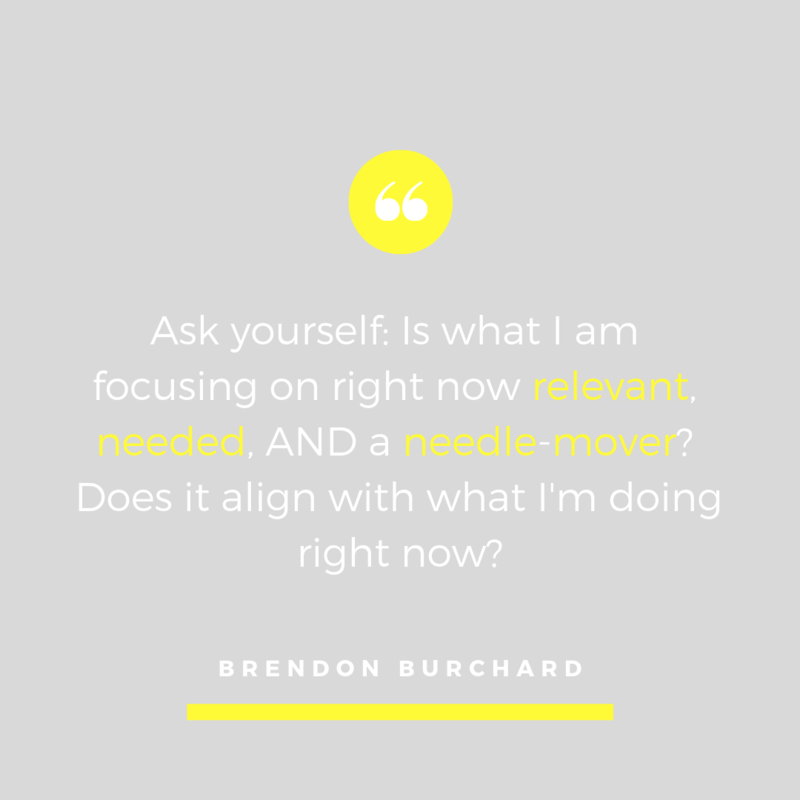 Would it be worth it even if everyone else thought you were slowing down, taking a step back, but you actually felt like you were moving towards that next chapter, and you were moving towards that better thing? Would that be worth it?” Worth can be flipped on its head. We think worth is all about someone not feeling worthy, but I’ll use “worth it” all the time. Is it worth it? “Has he ever said that before?” And either it’s ‘yes’ or it’s ‘no’. If it is true, if he’s said something like that before, I say, “Did you survive? You’re still here. If you survived it, it’s not a question of survival. Now let’s talk about how you want to thrive, how do you want to feel?” I’ll work through it that way. What I want to do is ask the questions that get them to minimize the excuse themselves. And one of the best ways to do that is make them say the thing that they’re so scared everyone’s going to say. As soon as they verbalize it, they see it has no power. My favorite way to move people through embarrassment or fear of others is to make them say it aloud. Step people through their fears. Ask them those questions, because as soon as they think through a fear or an excuse, they tend to see how small it is. Even if it’s not small, they recognize they can handle the impact. It’s not going to be a dinosaur situation. It’s not going to be a crater in the earth. Once you realize it’s all been said, there’s just no fear about it anymore. I don’t think there’s anything they could say on the internet about me that could ever slow me down because either they’ve already said it to me or I’ve said it to myself. And once you realize it’s all been said, you’re safe. What else are they going to say to you? Are you so scared that something’s going to come along tomorrow and say something so bad, and it’s going to embarrass you so much more than you’ve already been embarrassed? As adults, we’re carrying along enough old embarrassments, and enough old shame. Nothing new is going to come tomorrow, and once you understand that, it takes away a lot of that power. What are they going to say when I get on stage? I’m not a good dancer? Heard it. It’s nothing new to me. Once I’ve heard it, I can go out there and completely dork out on stage with zero holding back, because what else are they going to say? I’ve already heard it before. Step through it, have them see it, have them say it, and once they’ve said it and communicated it, the power is gone. People fear not meeting their responsibilities. “Well, I have that dream, but I can’t do it because of the kids.” The fear there isn’t they’ve tried in the past. The fear there isn’t bandwidth. The fear there isn’t worth or permission. The fear there isn’t embarrassment. The fear there isn’t even the support. The fear is: I can’t do that and meet my obligations of being a good mom. That’s a fear of a failure to meet their responsibility and it’s a very powerful thing. Ultimately, that’s a very positive excuse. It’s a very good thing, it’s not a limiting belief. It’s a motivating, powerful and beautiful belief. “I don’t want to do that because that’d be irresponsible to my family. That’d be irresponsible to our family, to our finances, I would fail to meet the responsibility of my team. If I did that, I would risk my team’s ability to pay their mortgages. If I did that, I’d risk the ability for us to have the lifestyle we have. I promised these people these things and if I do that I’d have to break those promises. I don’t want to fail to meet my responsibilities there.” That’s a great thing. There’s no limiting belief in that. That’s human virtue coming out. People grab that human virtue and make it a vice. Then we can explore that together. You have to unhook that. People get stuck. People try to talk around it. Instead, I want you to acknowledge it. Whatever that responsibility is that they feel like they don’t want to break, honor that, cheer that on, talk about it explicitly, and then point out the fact that they’re probably wasting time in some other part of their life. If they could minimize that, they could still meet the responsibility and still create the white space necessary to pursue their dream. Now the excuse that this responsibility is holding you back is diffused by the reality that they’re not yet using their time and prioritizing the way they could. What’s more threatening? What’s more difficult to take on? You could grab a couple more hours throughout the week to do something that matters. People can take that on. What they can’t take on is any concern of meeting that responsibility. I don’t try to mess with the responsibility. I honor, I cheer it on, I make sure that happens, I write it down in my notes. You should always know the responsibilities your clients are trying to meet. If you don’t know those, you can get yourself really stuck in a long cycle of not having any breakthroughs with them. But if you know the responsibilities they’re trying to meet, that will help you support them. “How are you going to have any energy if you don’t take care of your body better?” Now we’re in a conversation with health tied to the responsibility. When I know the responsibilities of my client, I bring those up in all our sessions. How I get such a depth of effect in my CHPC coaching is in knowing what’s really important to them, and bringing that into each of the sessions. The sessions don’t feel separate or away from what’s important to them. It feels like the sessions are facilitating what is important to them. I appreciate all of you here today, and I can’t wait to see you all soon!